Christmas is a joyful mix of food, festive cheer, friends and family but it's also about giving and receiving. A homemade gift is special whether it's jam, relish, sweets or biscuits. Something from your kitchen is also personal and will certainly outrate a store-bought present. 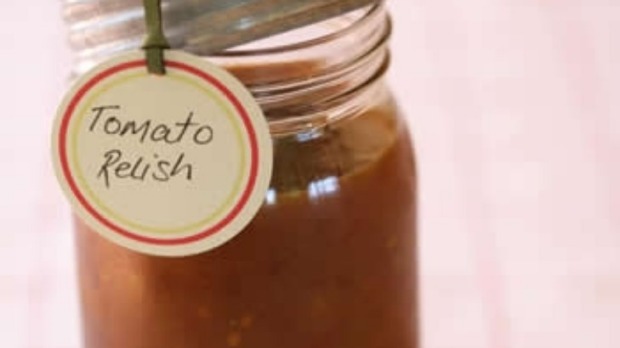 Combine tomatoes and onion in a large saucepan and add sugar and vinegar. Bring to the boil and simmer, stirring frequently for about 40 minutes or until mixture is reduced and thickens slightly. Combine flour, curry powder, mustard, salt, ginger and chilli powder in a small bowl and stir in 3 tablespoons of water to make a thick paste. Stir flour mixture into tomato mixture and simmer, stirring for 2-3 minutes until mixture thickens. Cool slightly, pour into warm sterilised jars and seal when cool.